This sounds so refreshing, yet also satisfying! 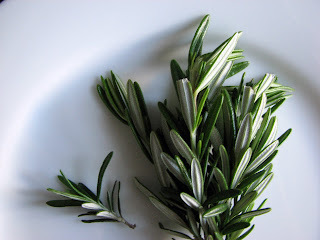 I love rosemary, and am intrigued by the flavor combo! That looks incredible! I've been meaning to make a honey ice cream and rosemary sounds intriguing! I have some ideas now. 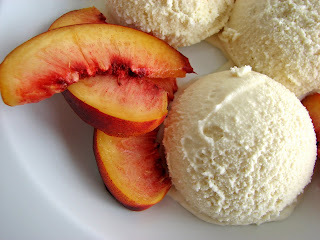 i also love herb infused ice creams with stone fruits for some reason. sounds great! I love honey and rosemary paired together, but in icecream? HOW WONDERFUL! I love all of the different ideas people come up with for ice cream. I am determined to get an ice cream maker and trying out some of my own. I think it's great to combine herbs with sweet things. This ice cream recipe looks delicious! 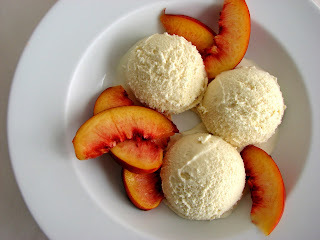 Ice cream is a staple in this house any time of the yr, this looks so good! Thank you all for your generous comments. This is one of my favorite ice creams and it's unbelievably versatile. If you don't have an ice cream maker, run do not walk and purchase one! There is NOTHING like home made ice cream. And half the fun is dreaming up all these interesting flavors. Cheers! What a delicious combo! Honey + Rosemary yummm. There is nothing better than stone fruits and herbs! They go so well together! Beautiful ice cream Gayle! Sounds absolutely delicious, especially with some summer fruits. I love the idea of this recipe.Oh the honey will be great for sure.Love this post! I have been trying to make this for a thanksgiving dessert.. And I'm having problems firming my mix. I have a Krups 358 (La Glaciere) and have followed every possible instruction. I eventually gave up and just poured the slushie liquid into an airtight container and in the freezer in hopes to have it harden.. Any advice? I love the taste.. :) just can't get it to set right! Did you thoroughly chill the base before trying to churn it? It takes a lot longer for your machine to churn it if the base is not icy cold. Did you increase the sugar and/or honey? That will prevent it from firming up properly. Once it's churned, it should firm up in about 3 hours or so, depending on your freezer. I hope it works out for you! It's a really delicious ice cream. the base has been in the freezer for months, lol, we almost never use it.. i saw your post and decided it was time ;) so yes, it was very cold.. i didnt increase anyting, i actually was doing a test batch, so i did half the recipe size. its been in the freezer, slooowly getting thicker. my Krups instructions said it should of thickened and solidified as it was churning (20-40 min) but it seemed more like it was 'blending'... when you do yours, does it get hard as you churn or once its in the freezer? could i be doing something wrong when its on the stove? im so excited to finally get to eat it..
melina, I was actually referring to the ice cream base being very cold and not the machine. But yes, the machine bowl has to be completely frozen. Whenever I churn ice cream, I always have to put it in the freezer for about 3 - 4 hours after it's done to firm it up. The churning aerates it, sort of "fluffing" it up and beginning the chilling process. But it nearly always takes more chilling to become scoop-able, depending upon the composition of the ice cream.